President Donald Trump is attacking Sen. Kirsten Gillibrand, D-N.Y., in retaliation for suggesting he resign in the face of sexual misconduct allegations by multiple women. Over a dozen women have accused Trump of sexual harassment and assault in the years before he was president. He has denied the allegations. "Lightweight Senator Kirsten Gillibrand, a total flunky for Chuck Schumer and someone who would come to my office 'begging' for campaign contributions not so long ago (and would do anything for them), is now in the ring fighting against Trump. Very disloyal to Bill & Crooked-USED!" Trump tweeted this morning. Schumer, who also represents New York, is the Senate minority leader. Gillibrand said thoroughly investigating the allegations against him is "the right thing to do." 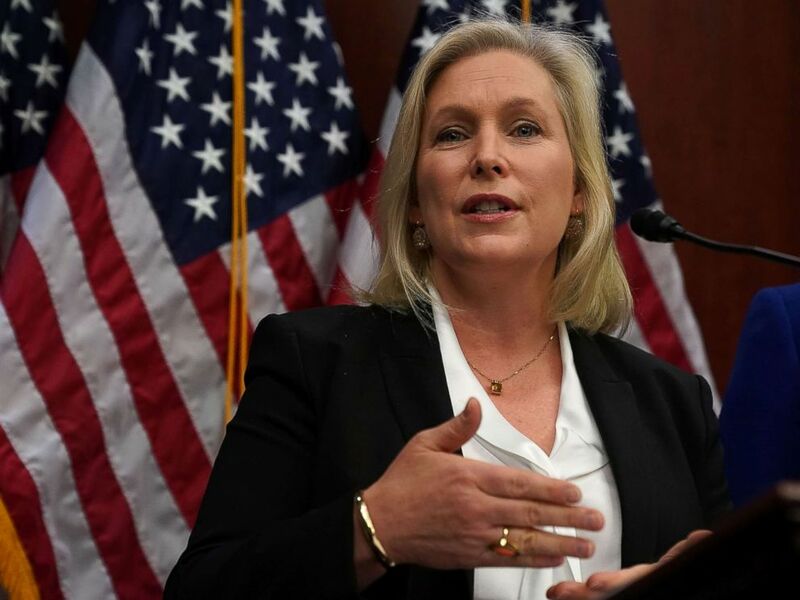 "It was a sexist smear attempting to silence my voice, and I will not be silenced on this issue, and neither will the women who stood up to the president yesterday," Gillibrand said on Capitol Hill today. U.S. Sen. Kirsten Gillibrand (D-NY) speaks during a news conference, Dec. 6, 2017, on Capitol Hill in Washington. The lawmaker unveiled bipartisan legislation to help prevent sexual harassment. ABC News reached out to the White House for clarification about Trump's remarks but did not receive a response by the time of publication. During the signing of the National Defense Authorization Act Tuesday, Trump ignored a reporter’s question about what he meant when he tweeted Gillibrand would “do anything” for campaign contributions. Rep. Katherine Clark, D-Mass., also weighed in with a statement. “Women know Trump is ‘that guy’ -- the insecure sexual predator who bullies any woman who dares to hold him accountable. Here’s what should really terrify him: Sen. Gillibrand has been standing up for women her whole career. She won’t be intimidated and neither will we,” Clark wrote. Gillibrand also responded to his tweet with her own this morning. Gillibrand is one of six senators — five Democrats and one independent — who called for Trump's resignation yesterday and today. "President Trump has committed assault, according to these women, and those are very credible allegations of misconduct and criminal activity, and he should be fully investigated, and he should resign," Gillibrand said in an interview with CNN on Monday. In the past week, three longtime members of Congress from both parties — Sen. Al Franken, D-Minn.; Rep. Trent Franks, R-Ariz.; and Rep. John Conyers, D-Mich. — announced their resignations after they were accused of sexual misconduct. All three men previously denied the accusations made against them. The Senate and House Ethics Committees launched investigations into the allegations made against their respective members. On Tuesday, Melinda McGillivray, one of the women accusing Trump of sexual harassment and assault, joined Jessica Leeds, Rachel Crooks, and Samantha Holvey in calling for a congressional investigation into Trump. "I demand that he is subjected to an investigation by the Ethics Committee. It's important that we hold this man to the highest standards. If 16 women have come forward, why hasn't anything been done? Where is our investigation? I want justice," McGillvray said on NBC's "Megyn Kelly Today." 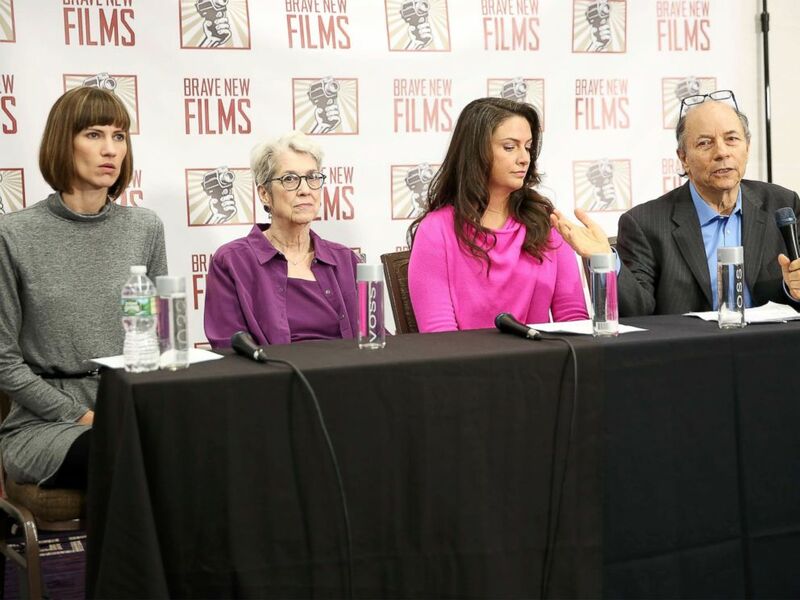 (L-R) Rachel Crooks, Jessica Leeds, Samantha Holvey and founder and president of Brave New Films Robert Greenwald speak during the press conference held by women accusing Trump of sexual harassment, Dec. 11, 2017, in New York City. McGillivray went public with her allegations in The Palm Beach Post during the presidential campaign. She claimed that Trump grabbed her rear end in 2003 when she was attending a concert at Mar-a-Lago. The White House responded to Leeds, Crooks and Holvey in a statement Monday, saying, "These false claims, totally disputed in most cases by eyewitness accounts, were addressed at length during last year's campaign, and the American people voiced their judgment by delivering a decisive victory. The timing and absurdity of these false claims speaks volumes, and the publicity tour that has begun only further confirms the political motives behind them." The calls for a congressional investigation into Trump are being echoed by 56 female Democratic members of the House of Representatives, the Democratic Women's Working Group. Led by Democratic Reps. Lois Frankel of Florida, Brenda Lawrence of Michigan and Jackie Speier of California, it said it plans to hold a press conference Tuesday afternoon to call for the House Committee on Oversight and Government Reform to investigate the allegations against Trump. The group announced Monday that it sent a letter signed by all its members to the committee's Chairman Trey Gowdy, R-S.C., and ranking member Elijah Cummings, D-Md., Frankel. "We cannot ignore the multitude of women who have come forward with accusations against Mr. Trump," the letter read. Trump accused Democrats of using "false" and "fabricated" allegations as a way to attack him because they have "been unable to show any collusion" between him and Russia in the 2016 presidential election, which is the focus of a special counsel investigation. "Despite thousands of hours wasted and many millions of dollars spent, the Democrats have been unable to show any collusion with Russia - so now they are moving on to the false accusations and fabricated stories of women who I don't know and/or have never met. FAKE NEWS!" Trump tweeted Tuesday morning. ABC News' Katherine Faulders, Mariam Khan and Kaelyn Forde contributed to this report.